In stock -This product will ship today if ordered within the next 14 hours and 17 minutes. This nutty tasting, unrefined, cholesterol-free 100% Certified Organic Flax Seed Oil is rich in the Omega 3 essential fatty acid (EFA), alpha-linolenic acid - typically 50-65%. It also provides the omega 6 EFA linoleic acid and oleic acid, the Omega 9 monounsaturated fatty acid (FA). 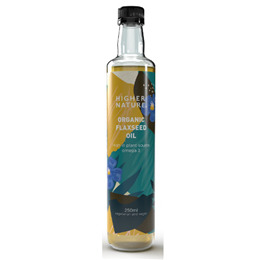 This Flax Seed Oil used in this product is made form 100% certified organic Flax seeds, cold-pressed and filtered to produce beautiful golden oil. Flax Seed Oil naturally contains mixed Tocopherols (Vitamin E) especially gamma Tocopherol and gamma and alpha Tocotrienols. Packaged in specially-made opaque, recyclable PET bottles, which help protect the oil against harmful UV light and oxygen. Packaged in light and oxygen-protective bottles. Do not heat. Not suitable for cooking baking or frying. Refrigerate after opening and consume within 6 weeks. Below are reviews of Omega Excellence Organic Flax Seed Oil - 350ml by bodykind customers. If you have tried this product we'd love to hear what you think so please leave a review. This nutty tasting, unrefined, cholesterol-free Certified Organic Flax Seed Oil is rich in the Omega 3 essential fatty acid, alpha-linolenic acid. It also provides omega 6 and Omega 9.